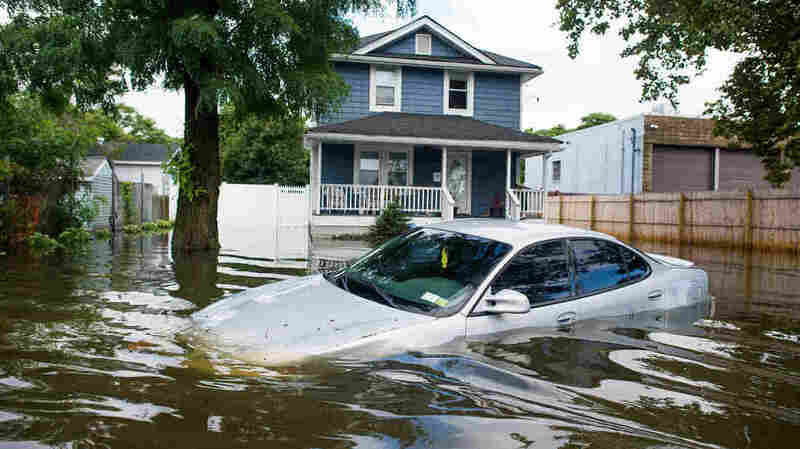 Long Island Soaked By Record-Breaking Rainfall : The Two-Way Flood warnings are still in effect for other parts of New England after an early-morning downpour jeopardized commuters in New York. One town has been hit with more than a foot of rain. A car is abandoned on a flooded street following heavy rains and flash flooding in Bay Shore, N.Y., on Wednesday. 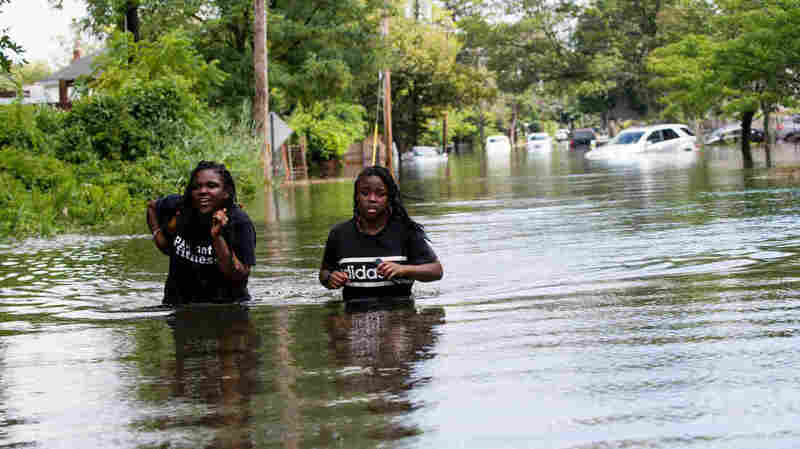 The South Shore of Long Island along with the tri-state region saw record-setting rain that caused roads to flood. Long Island, N.Y., was pummeled with rain today, possibly setting a state record for daily rainfall. 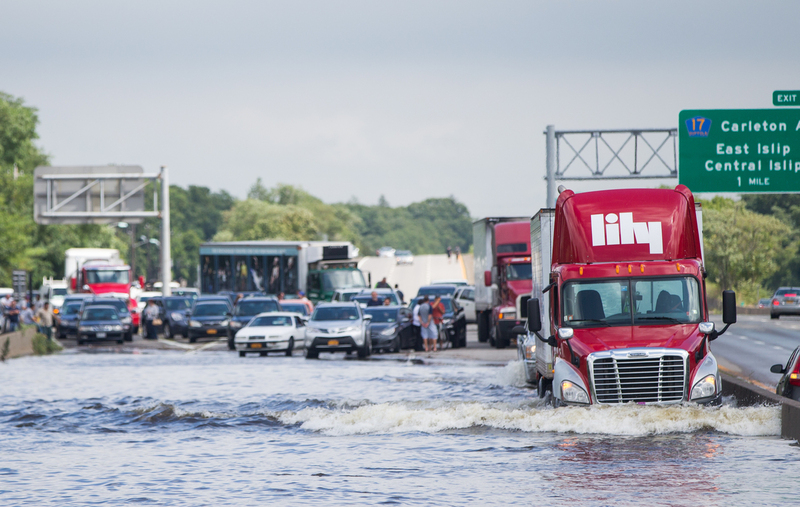 A trailer truck drives through a flooded Sunrise Highway in Islip. The town of Islip was hit the hardest, reports NPR's Sam Sanders. In one hour — between 5 and 6 a.m. — the area got more than 5 inches of rain. So far, 13 inches have fallen there, NBC New York says, "smashing the previous record for daily rainfall of 6.7 inches set on Aug. 24, 1990." National Weather Service spokesman Chirstopher Vaccaro tells Reuters that 13 inches is believed to be the most to have ever fallen in the state in a 24-hour period. Tim Morrin of the National Weather Service tells NPR the timing of the rain made things worse. "We started to get many reports of flooded highways and multiple rescue missions as commuters were traveling in the dark and not seeing the flooded roadways," he says. People wade along a flooded street in Bay Shore. The area is next to the town of Islip, which saw the heaviest rain. There are still active warnings for possible flash floods across eastern New England. There are also some remarkable images from Detroit of the flooding there earlier this week.